Prior to this Metro show, I’d only seen Los Campesinos! twice before. Both times were at Lollapalooza, but both were vastly different from one another. The first time, the band was playing one of the small side stages, had just released their first EP, and the crowd to watch them numbered less than 200. For a festival set, even on a side stage, it was a small crowd. Yet it was as if the band was hoping to win every single person over, even the ones casually walking by on their way to see another artist at another stage. They had an intense energy, playfulness and songs that showed it off while being catchy as hell. After the show, I immediately bought their EP and had them sign it, which all of them did while drawing doodles on it and chatting with me for an inordinate amount of time. There’s just something about those super young bands, so full of life and possibility, that you hope they never lose such charms. 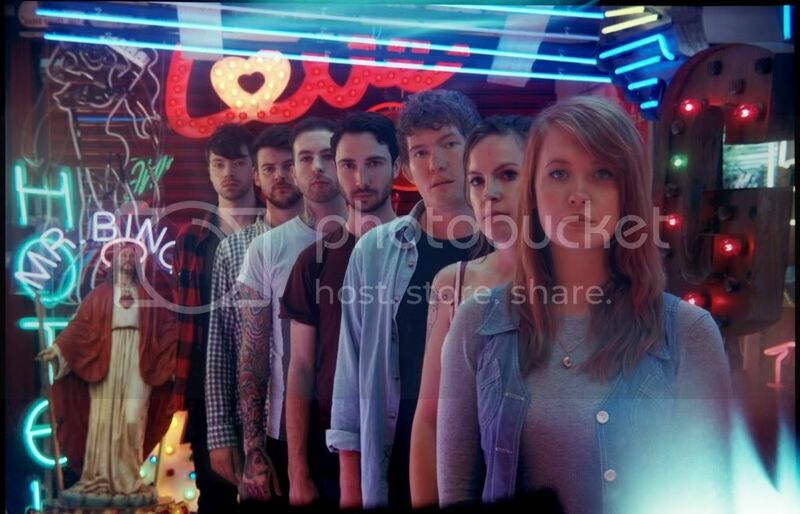 A couple years and a couple albums later, Los Campesinos! returned to Lollapalooza, this time on a massive stage with a massive crowd. I was excited to see my old friends again, but watching their set became a bit like going to your favorite hole-in-the-wall restaurant to find it’s now become super popular and there’s a 2 hour wait to get in. The band was getting the success they so rightly deserved, but I felt as if some of their edge had been lost. Throw on top of it the fact that one of their core members Aleks Campesinos! would be leaving the band at the end of the tour, and I began to worry about the future of these indie pop upstarts. Their last album Romance Is Boring was also much darker and less energetic than their previous efforts, though it was still one of the best records of 2010. That darkness held strong on their most recent effort Hello Sadness, but that album felt like it took the band full circle, the lyrics holding strong and the hooks suddenly perking up to increase the likeability factor. Turns out they’re doing just fine without Aleks (and a couple other now-former members) in the fold. It had become high time, in my mind, to finally see this band outside of a festival setting and see if they could win me over once again. All ages shows tend to bother me just a little bit, mostly because so much of the youth of today feels that talking to their friends while a band is performing right in front of them is a good idea. If you paid money to see a show, you’re there to watch the band, not talk to friends. You can do that anytime. For free. But the one thing all ages shows bring to the table is the spirit of youth. When everyone’s paying attention, there’s jumping around, sing-alongs at the top of your lungs, and generally good vibes to be absorbed by all. Los Campesinos! provided a great assist in all of this straight from the beginning of their set, starting with the dynamic first single and track off Hello Sadness, “By Your Hand”. Following it up immediately with prior singles “Romance Is Boring” and “Death to Los Campesinos!” both kept the energy level high and also provided a great retrospective of where the band is at present vs. where they were in their early days all of 4 years ago. It was the sonic equivalent of a knockout punch from the get-go, which is probably why everyone behaved themselves in the most immature way possible. There was dancing, there was singing, there was crowd surfing and even a touch of moshing, but thankfully it appeared that everyone was physically okay for the duration of the show. Gareth was doing his best to keep a cool head as the ringmaster of the proceedings, encouraging everyone to keep having a good time but also to be mindful of others and helping those in need. It was about building friendship and community as much as it was seeing some great songs performed, and it seems everyone got their way. Those hoping for catalogue-spanning highlights from Los Campesinos! weren’t really disappointed either, though as expected the majority of songs were from their new album Hello Sadness. It was grand to hear bouncing around from “Songs About Your Girlfriend” to “We Are Beautiful, We Are Doomed” to “There Are Listed Buildings” and “Straight in at 101” without so much as a blink of an eye. Things slowed down just past the midpoint of the set, as new songs “To Tundra” and “The Black Bird, The Dark Slope” were emotionally tough but dragged in a crowd that was looking for a good time all night. Nothing that a little “You! Me! Dancing!” couldn’t fix though, which it did and kept the celebration going for another few songs, including the encore. Closing out the main set was a very good rendition of “Baby I Got the Death Rattle”, even if much of the crowd apparently didn’t know the song’s closing lyrics of “Not headstone, but headboard/is where I want to be mourned.” Gareth clearly tried to get a sing-along started and it unfortunately didn’t quite work out. Finishing the encore with the classic “Sweet Dreams, Sweet Cheeks” worked out far better, and there was a distinct smell of satisfaction in the air when the band walked off the stage that last time. That smell may also have been sweat. What helps make Los Campesinos! an exceptional band, outside of their dynamic and fun live shows, is the respect they have for their fans. They walked off the stage, through the backstage area, and straight to the merch table, where they remained until the very last person had cleared the room. They signed stuff, drew stuff, took photos, shook hands, engaged in too-long conversations, and basically did the same thing as the first time I saw them in 2007. To know that in spite of all their success and growth the last few years that they still care for their fans and put in the time and effort, well to me that’s the mark of a great band. It’s also a big reason why I’ll probably be a fan of theirs for as long as they’re around.